Twisting or Re-twisting Natural Hair can be a daunting task. What makes it a little easier is watching your favorite show or listening to music while styling your hair. Time your #Washday, so that you can twist your hair while watching Scandal, Empire or the Real Housewives of Atlanta. A little Beyonce doesn’t hurt either. 1) Avocado with an egg. Apply to wet hair and let stand for 20 minutes. Packed with protein, vitamins and fatty acids. 2) Butter. Massage butter into hair and scalp for shiny locs. Cover with a plastic cup. Sit under dryer for 20 mins and rinse with shampoo. 3) Shampoo omelette. Mix an egg with your favorite shampoo to restore protein to the hair. 4) Banana, Mayo and Avocado Smoothie. The perfect fatty and protein treatment for shiny locs. If you have dry scalp, dandruff, split ends, breakage, dry hair or seriously damaged hair a hot oil treatment should be used regularly. Hot oil treatments should be applied to dry hair. Coconut oil, Castor oil, Avocado oil, Moringa oil, Argan oil, Vitamin E oil, Jojoba oil, Olive oil and Rosemary oil are some of the best oils to use. Kurlee Tropical Oils Blend is a pre-made blend of essential oils perfect for your hot oil treatment days. Slippery oils like coconut oil are a great way to loosen knots before detangling. First damp hair then saturate with oil. Let oil sit on hair overnight then finger detangle. If knots are being stubborn, heat olive oil and apply to area to further loosen knot. Adding conditioner also helps. Gently finger comb knotted area from tip to root until comb runs easily through hair. Cutting the knot out should always be the last resort. 1. Your hair is growing, you are just not retaining length because of breakage and split ends. 2. When was the last time you had a blow out? Curly hair disguises the true length of hair due to shrinkage. 5. Trimming hair too much or too little. 6. You are not sealing your ends. 7. Using too much heat. 1. Twist on 90% Damp Hair. 2. Use a buttery curl creme like Kurl Defining Creme that offers maximum hold. 3. Do not borrow hair while twisting. 4. Finger coil ends of twists. 5. Create small to medium twists for more definition. 6. Separate twists where the hair naturally separates to avoid frizz. 7. Secure twist out at night with a satin/silk bonnet or pillowcase. 1) After shampooing with a sulfate free moisturizing shampoo use a Leave-in Conditioner like Thirsty Kurls Leave-in Conditioner to restore moisture. 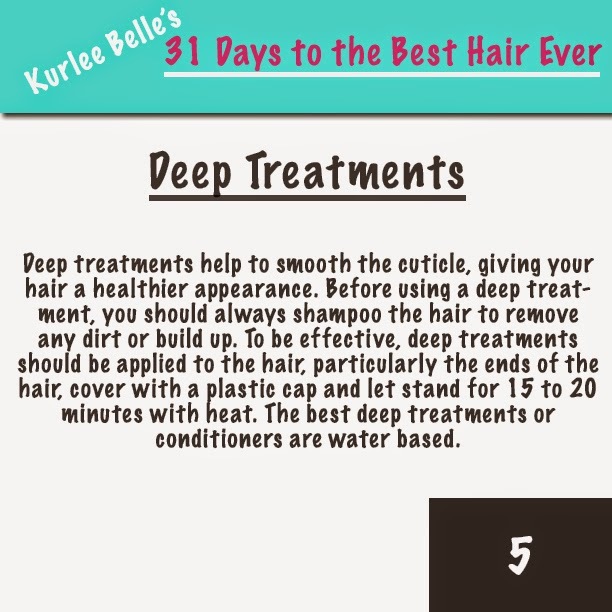 2) Use deep conditioning treatments at least 2 to 3 times a month. Banana Nut & Avocado Deep Treatment is a great option. 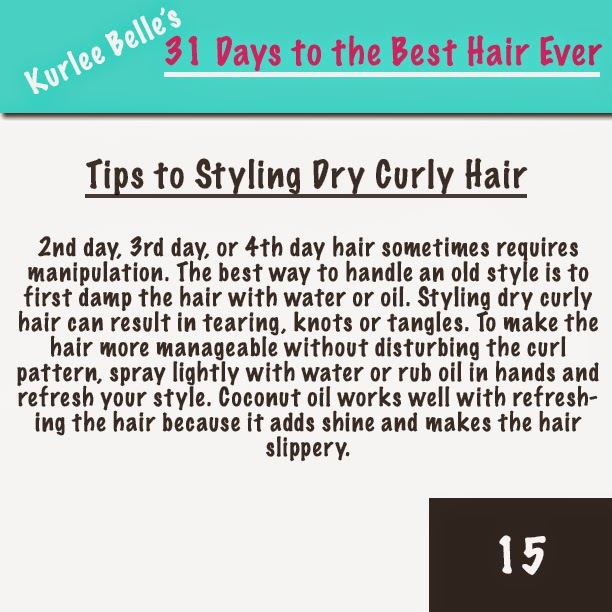 3) Nourish and lubricate your strands every other day with a fatty oil blend like Kurlee Tropical Oils Blend. Spinach is high in Vitamin A which is necessary for sebum production to keep hair moisturized. Vitamin A is also necessary for the growth of all bodily tissues including the skin and hair. Spinach and other leafy green vegetables are imperative in collagen production which provides structure to the hair and skin. Spinach is also high in iron-- iron deficiency is a common cause of hair loss. There are many causes for dry, flaky scalp and it can be embarrassing. Common causes of dry scalp include: dandruff, Psoriasis, Seborrheic Dermatitis, poor nutrition or lack of water. Depending on how severe your dry scalp is, it is recommended to consult a dermatologist. Helpful home remedies to reduce dry scalp would be to use moisturizing shampoos, medicated shampoos for dry scalp or overnight treatments of coconut oil or castor oil massaged into the scalp. Biotin, Folic Acid, and Zinc are the top choices for hair growth. Biotin deficiency results in hair loss and brittle nails. A deficiency in folic acid influences how fast and thick hair grows. Zinc deficiency can cause hair loss with hair growth returning when zinc is restored. Eating healthy and taking multivitamins are recommended for a healthy body and hair. Protein Treatments rebuild the cuticle layer of the hair shaft by filling in areas of weakness along the strand. Another benefit of protein treatments is that they help in repairing weak spots in the hair cuticle, strengthening and fortifying the hair while giving it a fuller appearance. 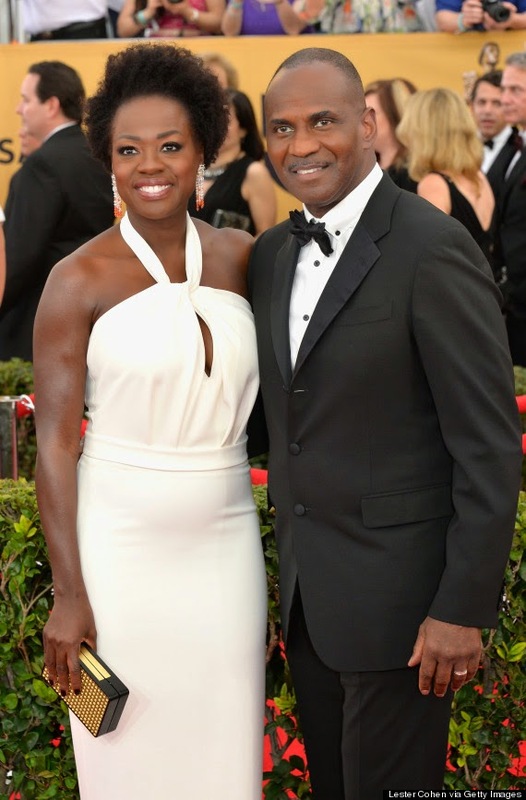 Protective styling is tucking away your ends from the atmosphere to protect them from damage while the hair grows. The premise is that if the ends of the hair do not break and your hair continues to grow, you will achieve longer hair. Popular protective styles: Braided extensions, weaves, wigs, Goddess Braid, and Ends Tucked Away Updos. Any girl knows that the hair starts to smell with excess sweat. Exercise does a body good but it can leave your hair smelling not so nice. Tea Tree Oil, Witch Hazel, Peppermint Oil, Lemon Juice, or Dry Shampoo. *Cotton balls are a great help for application. The hair strand is made mostly of protein. Heat has the ability to change the structure of protein bonds through a process called denaturation. Before heat styling, it is important to use a heat or thermal protectant to protect your strands. Curly hair that has been heat damaged no longer curls but is straight and lifeless. Heat damage is permanent like chemical straightening. 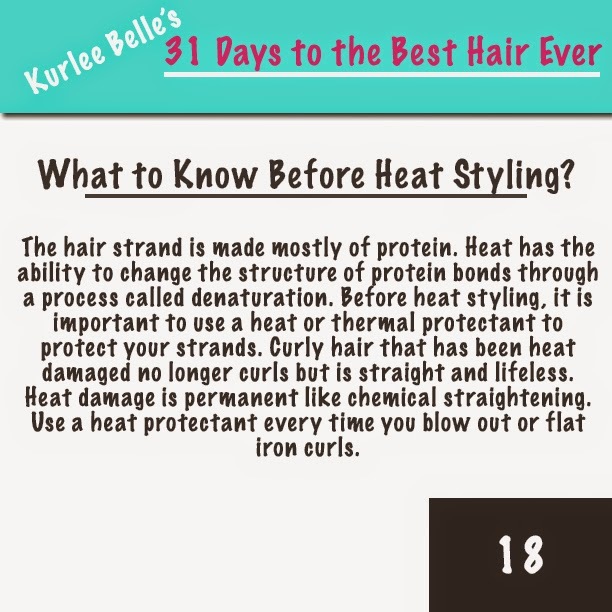 Use a heat protectant every time you blow out or flat iron curls. a) Protecting the hair follicles in preparation for shampooing. b) Softening and detangling locks to lessen breakage. c) Leaving the hair healthy and shiny. Wash Day is always easier when the hair is sectioned and detangled. Finger detangling is using your fingers like a comb to separate the hair strands. Finger detangling allows you to feel knots and tangles with your fingers and gently pull them apart. It is also very effective at removing shed hairs. Finger detangling before using a wide tooth comb or brush to completely detangle the hair reduces the risk of breaking or tearing the strands. 2nd day, 3rd day, or 4th day hair sometimes requires manipulation. The best way to handle an old style is to first damp the hair with water or oil. Styling dry curly hair can result in tearing, knots or tangles. To make the hair more manageable without disturbing the curl pattern, spray lightly with water or rub oil in hands and refresh your style. Coconut oil works well with refreshing the hair because it adds shine and make the hair slippery. Leave-in conditioners are lighter than rinse out and deep treatments because their main purpose is to fortify the hair with strength, moisturize, and aid in detangling before styling. Leave-in’s are designed to be used daily during styling to aid in the hair’s elasticity, hydration and manageability without leaving build up. A great leave-in conditioner is light, slippery and works well with stylers like creams or gels. 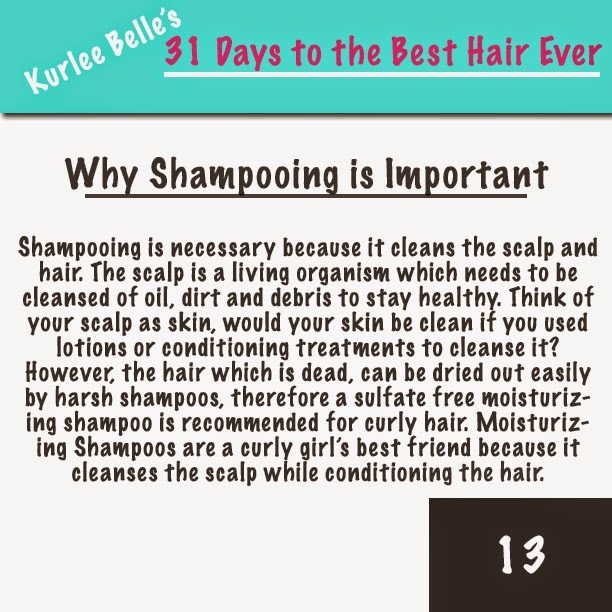 Shampooing is necessary because it cleans the scalp and hair. The scalp is a living organism which needs to be cleansed of oil, dirt and debris to stay healthy. Think of your scalp as skin, would your skin be clean if you used lotions or conditioning treatments to cleanse it? However, the hair which is dead, can be dried out easily by harsh shampoos, therefore a sulfate free moisturizing shampoo is recommended for curly hair. Moisturizing Shampoos are a curly girl’s best friend because it cleanses the scalp while conditioning the hair. 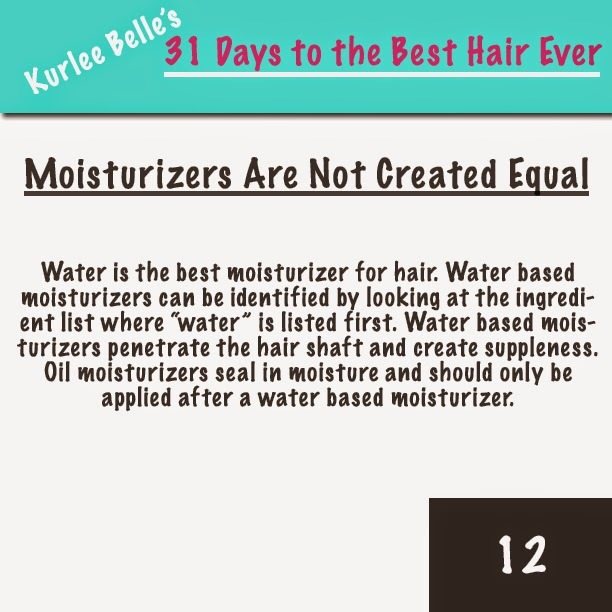 Water is the best moisturizer for hair. Water based moisturizers can be identified by looking at the ingredient list where “water” is listed first. Water based moisturizers penetrate the hair shaft and create suppleness. Oil moisturizers seal in moisture and should only be applied after a water based moisturizer. Silicon-based products give the hair the illusion of being healthier and smoother but they are actually bad for the hair. Silicones coat the hair shaft and seal out moisture by clogging the hair follicles. 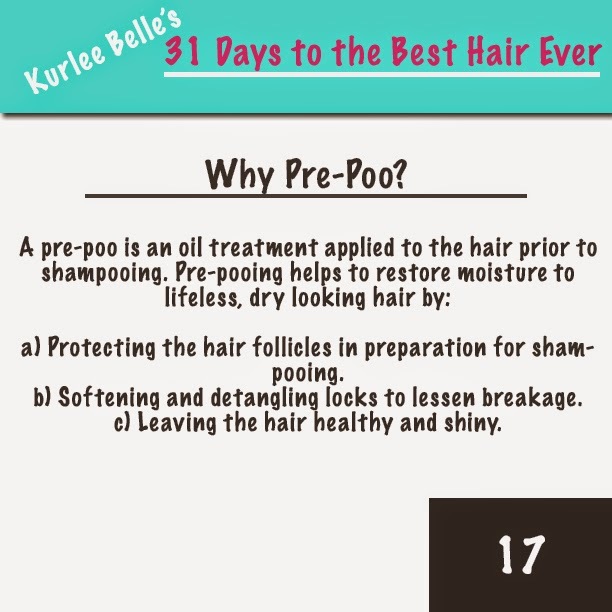 This makes the hair weaker and causes breakage. Stay away as much as possible. 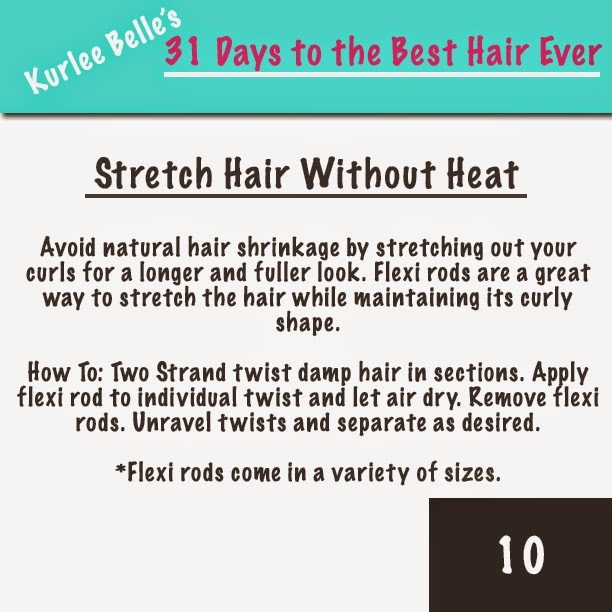 Avoid natural hair shrinkage by stretching out your curls for a longer and fuller look. Flexi rods are a great way to stretch the hair while maintaining its curly shape. How To: Two Strand twist damp hair in sections. Apply flexi rod to individual twist and let air dry. Remove flexi rods. Unravel twists and separate as desired. *Flexi rods come in a variety of sizes. 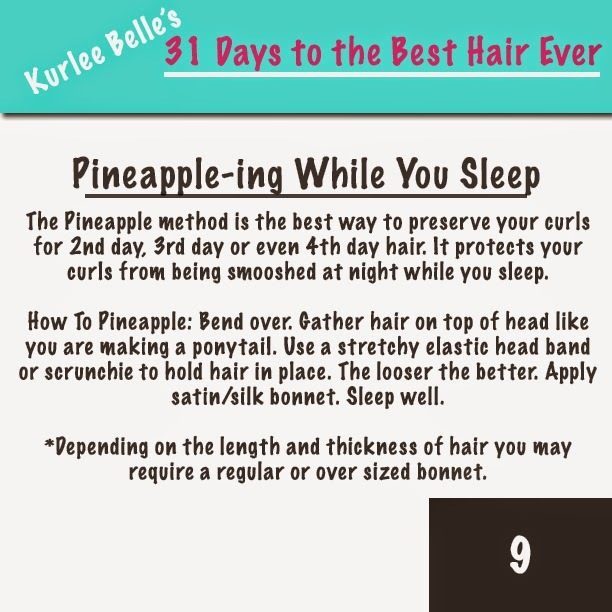 The Pineapple method is the best way to preserve your curls for 2nd day, 3rd day or even 4th day hair. It protects your curls from being smooshed at night while you sleep. How To Pineapple: Bend over. Gather hair on top of head like you are making a ponytail. Use a stretchy elastic head band or scrunchie to hold hair in place. The looser the better. Apply satin/silk bonnet. Sleep well. *Depending on the length and thickness of hair you may require a regular or over sized bonnet. The key to a successful Wash n Go without build up is in product application. 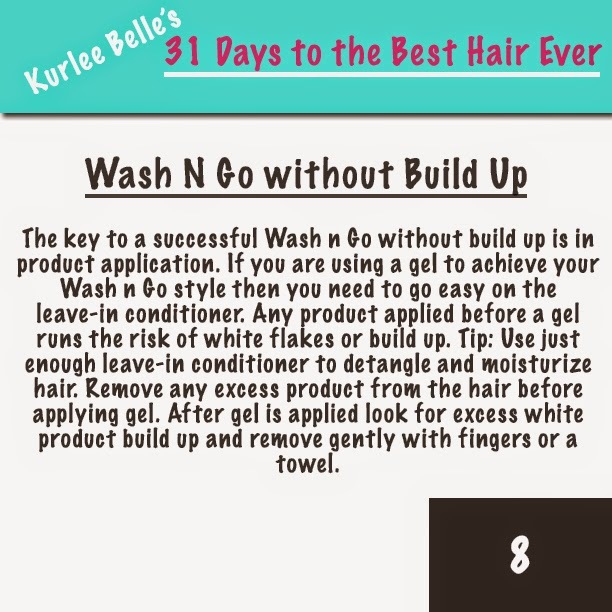 If you are using a gel to achieve your Wash n Go style then you need to go easy on the leave-in conditioner. Any product applied before a gel runs the risk of white flakes or build up. 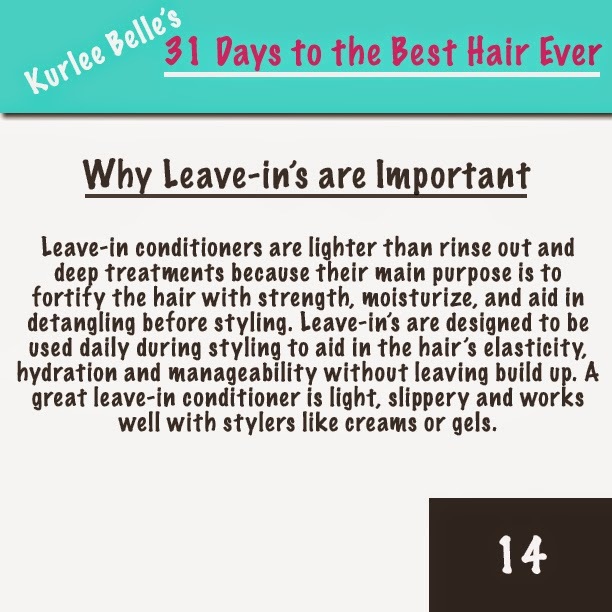 Tip: Use just enough leave-in conditioner to detangle and moisturize hair. Remove any excess product from the hair before applying gel. After gel is applied look for excess white product build up and remove gently with fingers or a towel. 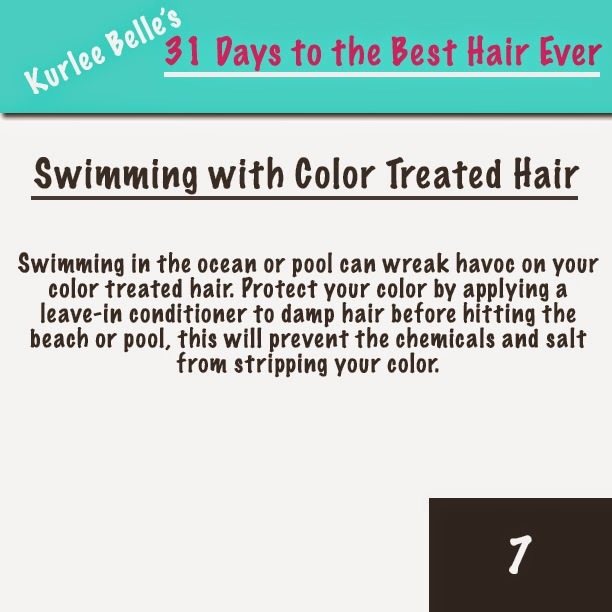 Swimming in the ocean or pool can wreak havoc on your color treated hair. Protect your color by applying a leave-in conditioner to damp hair before hitting the beach or pool, this will prevent the chemicals and salt from stripping your color. 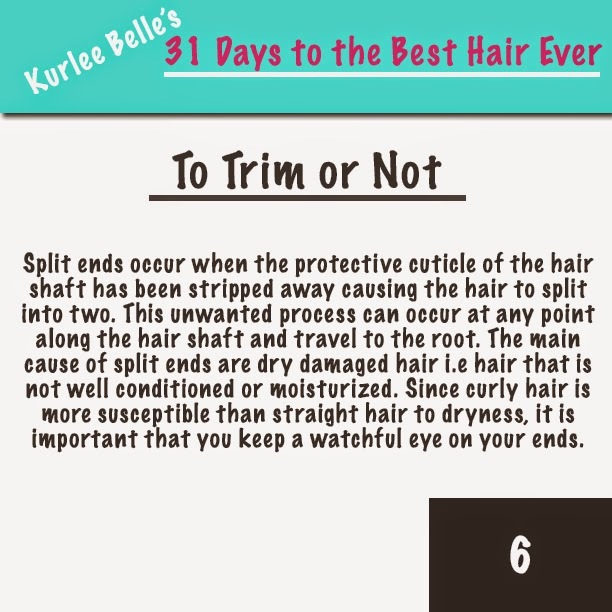 Split ends occur when the protective cuticle of the hair shaft has been stripped away causing the hair to split into two. This unwanted process can occur at any point along the hair shaft and travel to the root. The main cause of split ends are dry damaged hair i.e hair that is not well conditioned or moisturized. Since curly hair is more susceptible than straight hair to dryness, it is important that you keep a watchful eye on your ends. Protein treatments rebuild the cuticle layer of the hair shaft by filling in areas of weakness along the hair strand. Protein treatments help in repairing weak spots in the hair cuticle. There is nothing else that bonds to the hair like protein. Weekly protein treatments help to maintain the health of hair while keeping it balanced, thick and strong. 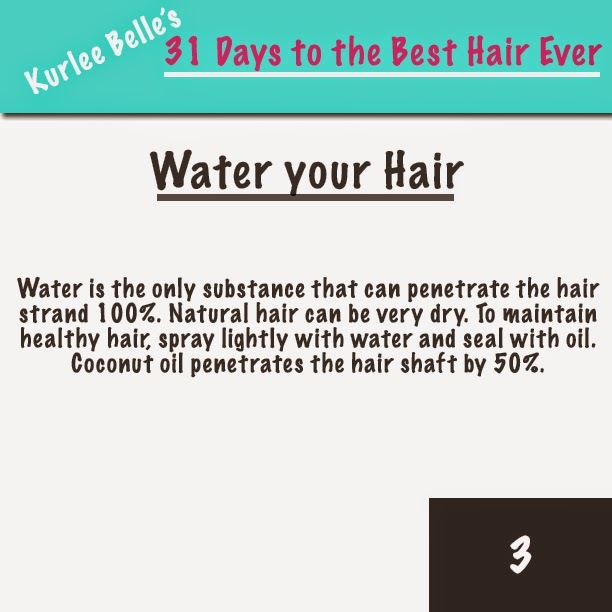 Water is the only substance that can penetrate the hair strand 100%. Natural hair can be very dry. To maintain healthy hair, spray hair lightly with water and seal with oil. Coconut oil penetrates the hair shaft by 50%. 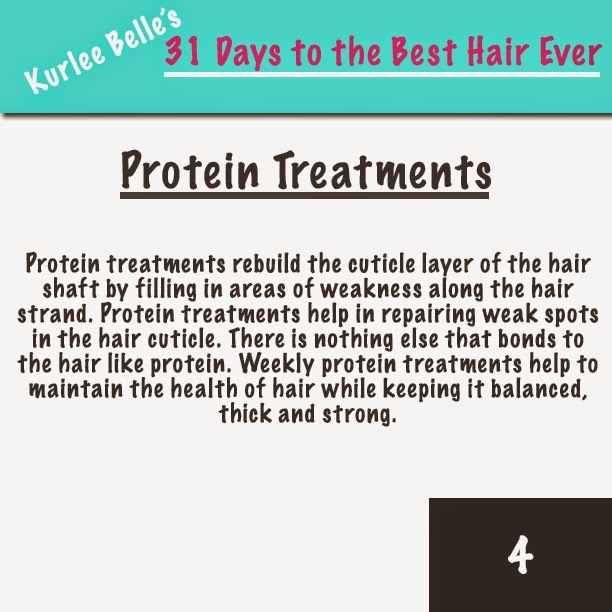 A strand of hair is comprised of mostly protein which means hair needs protein to grow. 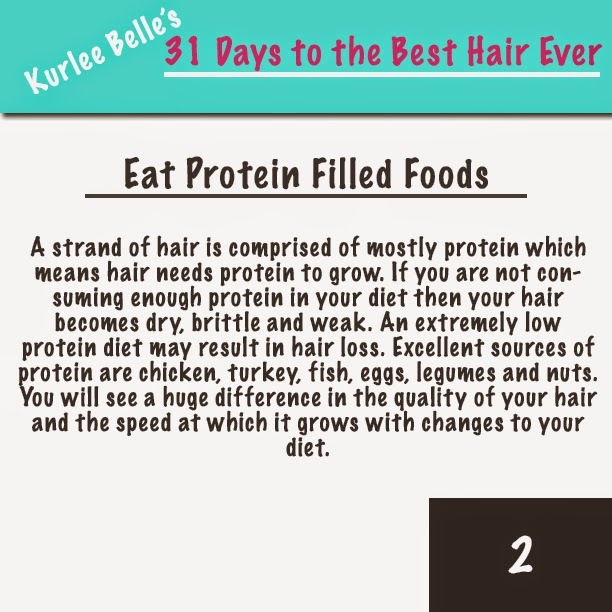 If you are not consuming enough protein in your diet then your hair becomes dry, brittle and weak. An extremely low protein diets may result in hair loss. Excellent sources of protein are chicken, turkey, fish, eggs, legumes and nuts. You will see a huge difference in the quality of your hair and the speed at which it grows. 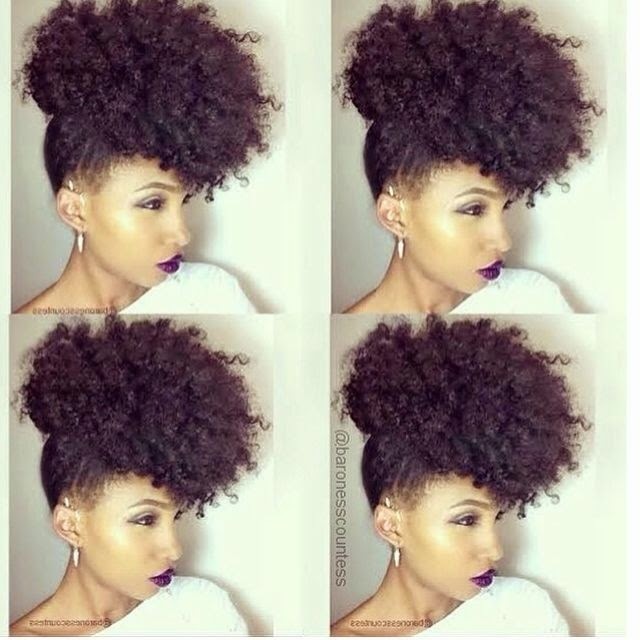 @BaronessCountess rocks a textured updo puff! This style is the perfect way to revive an old Wash N Go. 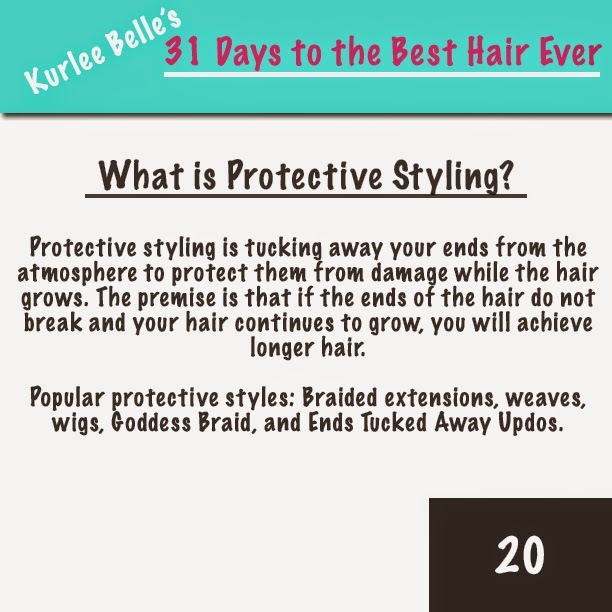 *Style Suggestions by Kurlee Belle: Use stretchy elastic headband to create puff. Use bobby pins to pin headband in place. A little Jelle Coconut Styling Gel with a spritz of water and a brush to smooth edges and back of style then spray lightly with Kurlee Tropical Oils Blend to bring back shine. To make your style look edgy, rock a dark lip like Cyber by MAC with winged out eyes. 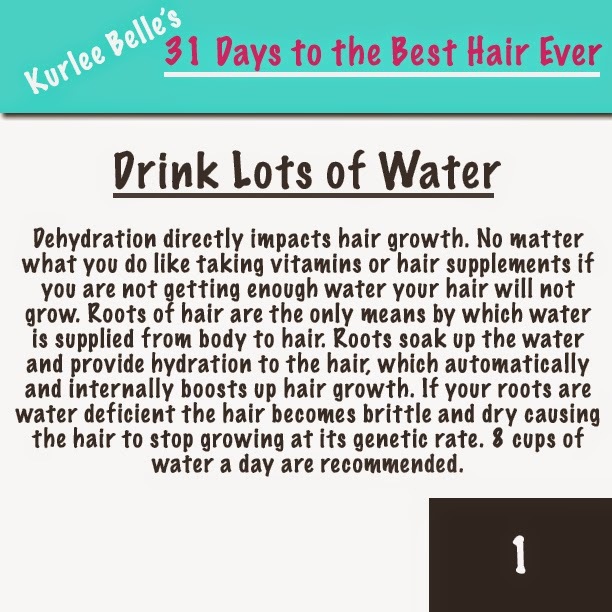 Dehydration directly impacts hair growth. No matter what you do like taking vitamins or hair supplements if you are not getting enough water your hair will not grow. Roots of hair are the only means by which water is supplied from body to hair. Roots soak up the water and provide hydration to the hair, which automatically and internally boosts up hair growth. If your roots are water deficient the hair becomes brittle and dry causing the hair to stop growing at its genetic rate. 8 cups of water a day are recommended.